Soldiers Letters From Camp, Battle-Field and Prison . Edited by Lydia Minturn Post. Published for the US Sanitary Commission. Bunce & Huntington Publishers. 540 Broadway. New York. 1865. Contains letters written by William McLain. Co B. 32nd OVI. Thanks to Larry Strayer for this source. Soldiers Letters From Camp, Battle-Field and Prison . Edited by Lydia Minturn Post. Published for the US Sanitary Commission. Bunce & Huntington Publishers. 540 Broadway. New York. 1865. Contains letters written by W.S. Hubbell 32nd OVI. Thanks to Larry Strayer for this source. Patriotic Poems by J.K. Butler . James K. Butler. Co. C. 32nd OVI. Copyrighted May 29, 1916. NP. Mt. Vernon. Ohio? Poems titled: A Poem to Abraham Lincoln, A Poem for Decoration Day, To the Sons of Veterans, To the Daughters of Veterans. Robert J. Hamilton 32nd O.V.I. Mortally wounded at battle of Camp Alleghany, Va. Colonel Thomas H. Ford organized the Regiment in July, 1861 and in September it went to West Virginia. The 32nd made a good fight at Harper's Ferry in 1862, losing 150 officers and men, and was paroled at the surrender of that post and sent to Chicago, Ill. It was exchanged in January, 1863, and reported the same month to Grant at Memphis, and did good service in the Vicksburg campaign. In the spring of 1864 it returned from veteran furlough, joined Sherman's army in Georgia and remained with that army until reaching Washington in May, 1865, taking part in all the main engagements characterizing that army's movements. The Regiment, 950 strong at its muster-in, received 1,600 recruits, yet showed but 565 on its rolls when mustered out at Louisville in 1865. 32nd Regiment Infantry. Organized at Mansfield, Ohio, August 20 to September 7, 1861. Left State for Grafton, W. Va., September 15, thence moved to Cheat Mountain Summit. Attached to Kimball's Brigade, Cheat Mountain, District West Virginia, to November, 1861. Milroy's Brigade, Reynolds' Command, Cheat Mountain, District West Virginia, to March, 1862. Milroy's Brigade, Dept. of the Mountains, to June, 1862. Piatt's 2nd Brigade, 1st Division, 1st Corps, Pope's Army of Virginia, to July, 1862. Piatt's Brigade, White's Division, Winchester, Va., to September, 1862. Miles' Command, Harper's Ferry, W. Va., September, 1862. 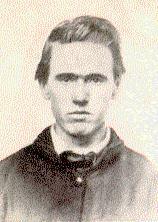 Captured September 15, 1862. 3rd Brigade, 3rd Division, 17th Army Corps, Army of the Tennessee, January to December, 1863. 2nd Brigade, 3rd Division, 17th Army Corps, to July, 1864. 1st Brigade, 4th Division, 17th Army Corps, to April, 1865. 2nd Brigade, 4th Division, 17th Army Corps, to July, 1865. SERVICE.--Action at Greenbrier River, W. Va., October 3-4, 1861. Duty at Greenbrier till December. Action at Camp Allegheny December 13. Duty at Beverly December, 1861, to April, 1862. Expedition on the Seneca April 1-12. Action at Monterey April 12. At Staunton till May 7. Battle of McDowell May 8. Battle of Cross Keys June 8. Duty at Strasburg and Winchester till September. Evacuation of Winchester September 2. Defence of Harper's Ferry, W. Va., September 12-15. Maryland Heights September 12-13. Regiment surrendered September 15. Paroled September 16 and sent to Annapolis, Md., thence to Chicago, Ill., and to Cleveland, Ohio. Exchanged January 12, 1863. Moved to Memphis, Tenn., January 20-25, 1863, thence to Lake Providence, La., February 20, and to Milliken's Bend, La., April 17. Movement on Bruinsburg and turning Grand Gulf April 25-30. Battle of Port Gibson May 1. Raymond May 12. Jackson May 14. Champion's Hill May 16. Siege of Vicksburg, Miss., May 18-July 4. Assaults on Vicksburg May 19 and 22. Surrender of Vicksburg July 4, and garrison duty there till February, 1864. Expedition to Monroe, La., August 20-September 2, 1863. Expedition to Canton October 14-20. Bogue Chitto Creek October 17. Meridian Campaign February 3-March 2. Baker's Creek February 5. Moved to Clifton, Tenn., thence march to Ackworth, Ga., April 21-June 8. Atlanta (Ga.) Campaign, June 8-September 8. Operations about Marietta and against Kenesaw Mountain June 10-July 2. Assault on Kenesaw June 27. Nickajack Creek July 2-5. Howell's Ferry July 5. Chattahoochie River July 6-17. Leggett's or Bald Hill July 20-21. Battle of Atlanta July 22. Siege of Atlanta July 22-August 25. Flank movement on Jonesboro August 25-30. Battle of Jonesboro August 31-September 1. Lovejoy Station September 2-6. Operations against Hood in North Georgia and North Alabama September 29-November 3. Shadow Church and Westbrook's near Fairburn October 2. March to the sea November 15-December 10. Louisville November 30. Siege of Savannah December 10-21. Campaign of the Carolinas January to April, 1865. Salkehatchie Swamp, S. C., February 2-5. River's Bridge, Salkehatchie River, February 3. South Edisto River February 9. Orangeburg February 11-12. Columbia February 15-17. Fayetteville, N. C., March 11. Battle of Bentonville March 20-21. Occupation of Goldsboro March 24. Advance on Raleigh April 10-14. Occupation of Raleigh April 14. Bennett's House April 26. Surrender of Johnston and his army. March to Washington, D.C., via Richmond, Va., April 29-May 20. Grand Review May 24. Moved to Louisville, Ky., June 8. Mustered out July 20, 1865. Regiment lost during service 5 Officers and 99 Enlisted men killed and mortally wounded and 2 Officers and 143 Enlisted men by disease. Total 240.